Powder Coatings Market size surpassed USD 10 billion in 2017 and is projected to witness over 6% CAGR from 2018 to 2024. Factors, such as technological advancement, ease of application, product development along with increasing consumer spending are among the key aspects driving the powder coatings market growth. 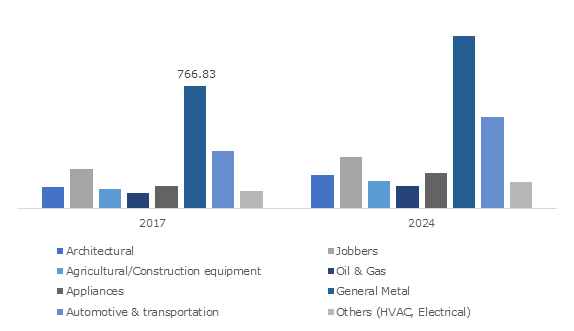 Strong outlook in automotive, home appliances, and architectural applications will fuel the powder coating market demand over the forecast timeframe. Mounting automotive production in developing regions accompanied by the ease in product availability will boost the market expansion. In 2017, the global cars and commercial vehicles production were around 97.3 million units, observing 2.4% growth in the same year. Ability to enhance the durability and provide improved thermal, chemical, and electrical resistance is escalating the product penetration in diverse industries. Improved metallic color space along with enhanced abrasion & scratch protection will also support the powder coatings market demand. Additionally, lower costs as compared to liquid coatings owing to higher transfer efficiency is positively driving the industry growth. Advantages such as reuse & recycling of the over-sprayed product are the foremost factor increasing the transfer efficiency of powder coatings. Its transfer efficiency can be as high as 95%, whereas for liquid coatings it is less than 40%, as the over-sprayed liquid gets evaporated. Also, higher coating effectiveness will fuel the market size over the next few years. For instance, a single layer of powder coating can provide similar or higher mechanical, chemical, & thermal performance as compared to double coated liquid systems. Stringent government regulations pertaining to volatile organic compounds (VOCs) content in coatings is escalating the powder coatings market growth. For instance, in China, the government has imposed taxes on coatings liquid coatings that do not meet the VOC threshold. Further, the U.S. Environmental Protection Agency provides the VOC regulations on aerospace surface coatings, appliance surface coatings, architectural & maintenance coatings, on shipbuilding surfaces, and other coatings. Also, considerations such as zero hazardous waste creation will escalate the product penetration up to 2024. In several end-use industries, A shift is observed from liquid coatings as powder coatings are solvent-free or low-VOC content products, whereas liquid coatings contain a higher amount of solvents or VOCs. Though, higher machinery procurement & energy costs for coating of large equipment is among the key challenges faced by the powder coatings market. Powder coatings manufacturers are focusing on increasing their production capacity to further reduce the product cost, thereby countering the challenges. Increasing R&D investments towards product development for specific applications is driving the powder coating market share. For instance, in December 2016, Axalta Coating Systems launched two new products for oil & gas pipelines, with the capability to withstand temperatures as high as 2000C in a highly corrosive environment. Technological advancements and product innovations for non-metal substrates including medium-density fiberboard (MDF), high-density fiberboard (HDF), and other wooden surfaces will create new growth opportunities for the manufacturers. For instance, in 2014, IGP launched its ultra-low temperature powder coating IGP-RAPID for wooden materials such as MDF. Thermoset resins dominate the global powder coatings market volume and are projected to witness over 6.5% CAGR from 2018 to 2024. Thermoset resins are segmented into epoxy, polyester, polyurethane, acrylic, and epoxy polyester hybrid resins. Higher thermal protection, thereby reducing the chances of melting on the application of heat, will stimulate the product demand from 2018 to 2024. Resistance to deformation along with better aesthetic appearance are among the key drivers for the product penetration. Cost-effectiveness of thermoset resins positively influences the powder coatings market growth. Powder coatings market from automotive and transportation components is projected to observe over 7% CAGR over the forecast timeframe. It finds high applications in the automotive components including wheels, mufflers, bumpers, door handles, primers, engine parts, windshield wipers, shock absorbers, and other parts. High product usage in OEM & aftermarket parts is proliferating the industry share. Strict VOC norms for automotive coatings accompanied by product advantages such as superior finish, improved durability & corrosion protection will escalate the product penetration in the automotive & transportation component applications. Further, growth in automotive aftermarket accompanied by rising demand for performance parts will support the powder coatings market development. Agriculture & construction equipment application holds a substantial share in the global powder coatings market. Ability to withstand high temperature along with superior corrosion prevention is fuelling the business growth. The rapid expansion of the residential construction sector in developing economies will fuel demand for construction equipment, thereby supporting the powder coatings market development. For instance, as per IBEF, the construction equipment market in India is projected to reach around USD 5 billion by 2020. Metallic substrates accounted for around 95% of the global powder coatings market revenue. Product usage in diverse applications with metallic products such as automotive parts, job shops, outdoor furniture, home appliances & consumer goods, oil & gas pipes, and HVAC will proliferate the powder coatings market share up to 2024. Features such as uniform coating, ease in applying, along with the ability to withstand extreme temperatures will boost the industry growth through metallic substrates. However, product usage in non-metal substrates will grow at a faster rate, majorly due to technological advancements supported by increasing launches for wood surfaces. Product availability in a variety of colors & finishes will augment the business revenues. Asia Pacific powder coatings market accounted for over 40% of the industry share in 2017 and is projected to witness a significant growth up to 2024. 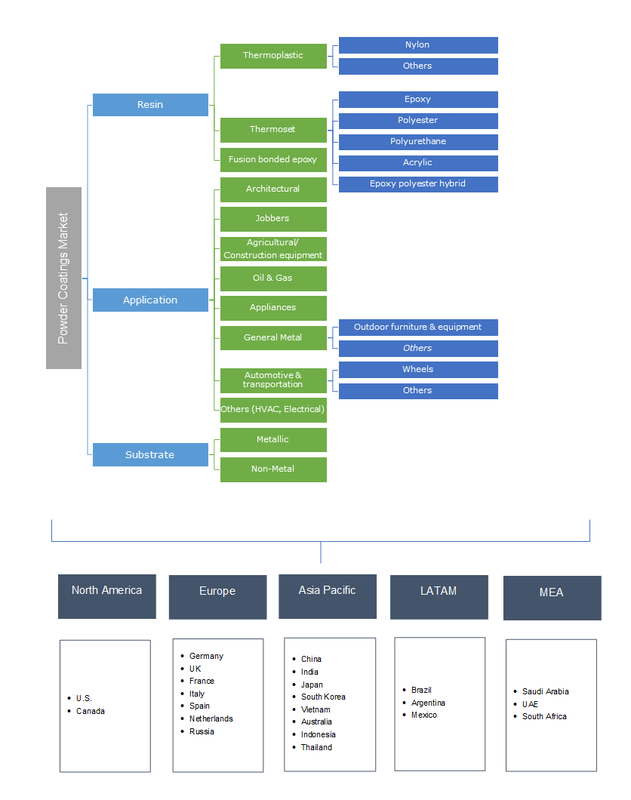 China, India, & Japan are the key powder coatings markets in the region. Increasing industry competitiveness supported by growing demand for coatings will augment the industry scope over the forecast timeframe. Strong growth in end-use industries including agricultural & construction equipment, A&T, and home appliances supported by strong FDI inflows in diverse consumer segments is propelling the market development. Cost competitiveness owing to high production and ease in raw material availability will fuel the product penetration. LATAM powder coatings market revenue is forecast to witness over 6.5% CAGR from 2018 to 2024. This is due to robust growth in the automotive sector owing to economic growth, reducing inflation, and lower lending rates. In 2017, Brazil’s vehicle production grew by 25.2% as compared to the previous year, and Mexico observed 13% higher production in the same year. Growing hospitality industry will support commercial construction growth, thereby fueling the industry share through architectural applications. Further, elevating residential construction owing to rise in government & private investments, along with increasing competitiveness in the powder coating industry will surge the product penetration. As per CBIC, Brazil’s new residential sales have increased by 22.3% in the first quarter of 2018 as compared to 2017. The global powder coatings market is highly fragmented owing to the presence of several multinational corporations and increasing count of regional manufacturers. The key industry players include AkzoNobel NV, PPG Industries Inc., Jotun Powder Coating, Axalta coating systems LLC. Other prominent manufacturers include Evonik Industries, Asian Paints Limited, The Sherwin -Williams Company, Kansai Paints Company Ltd., and RPM International, Inc. The key strategies observed in the industry for gaining market share include new product launches, geographical expansions, mergers, acquisitions, and collaborations. In November 2017, AkzoNobel acquired the Thailand based manufacturer V.Powdertech Co. Ltd., to enhance its product offerings for home appliances, industrial applications, and furniture. The global paints & coatings industry is observing significant transformations owing to increasing focus on environmental concerns. Manufacturers are working on improving their product margins by launching environmental compliant products, further gaining competitive advantage. Increasing powder coatings adoption supported by enhanced production levels will contribute towards economies of scale, thus reducing the end-product costs. Increasing product launches supported by strategic R&D investments towards lower cure temperatures, lower VOC emissions, and extended durability will escalate the product scope globally.